A Caritas team has been assessing needs of migrant workers fleeing violence in Libya and stranded on the Egyptian-Libya border in Salloum. 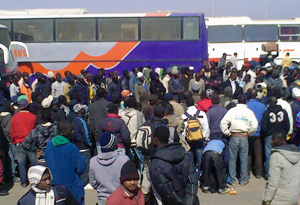 Around 6000 migrant workers are stranded in Salloum and around 5000 people are arriving daily. Asian and African migrants wait two to six days to be processed through the border. They are the difficult cases because of the lack of documentation or lack of embassy support to assist in repatriation efforts. The team says most of the basic needs of migrants in Salloum are being met, but there is an urgent need to speed up the repatriation process. The team includes staff from Caritas Egypt and Catholic Relief Services (CRS is a Caritas member). Speaking from the border crossing, CRS Country Representative for Egypt Jason Belanger said, “The situation is calm. Some of the migrants are saying they have not received enough food and water. Mostly men, they are sleeping out in the open. Sanitation is a key concern with an acute lack of toilets. The team says the migrants appear well looked after by the Egyptians military. Caritas members in these countries are also looking at helping their nationals home and providing support once they arrive. Caritas has sent another Emergency Response Teams to the Libyan-Tunisian borders in order to assess the refugee’s needs and set up emergency aid. In addition to that, Caritas is working in close collaboration with its national member organisations in Niger and Libya. According to IOM, 172,874 people, mainly migrant workers, had left Libya up to 2 March. Of those, 79,199 went to Egypt, 91,175 to Tunisia and an estimated 2,500 to Niger. However, the IOM pre-crisis migration figures for Libya were estimated at 2.5 million migrant workers, of which ca. 1 million were Egyptian workers (Source: IOM and UNHCR Joint Appeal for Massive Evacuation of People fleeing Libya into Tunisia, presented to Member States on 2 March in Geneva). Please call Patrick Nicholson on +39 06 698 79 725 or +39 334 359 0700 or email nicholson@caritas.va with any requests.